Desi Henry was fastest through stage three but he reckons he still has some issues to sort in his Skoda. Callum Devine was full of confidence after sorting his handling issues and was second fastest. 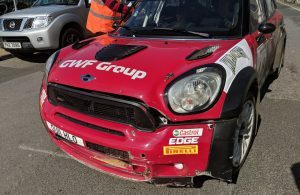 That’s moved him into second overall ahead of Philip Allen who was distracted a little by a fuel pressure light which illuminated during the stage. Derek McGarrity is making some progress as he continues to acclimatise to his first closed-road event since July. Alan Carmichael and Derek McGeehan both had clean runs. 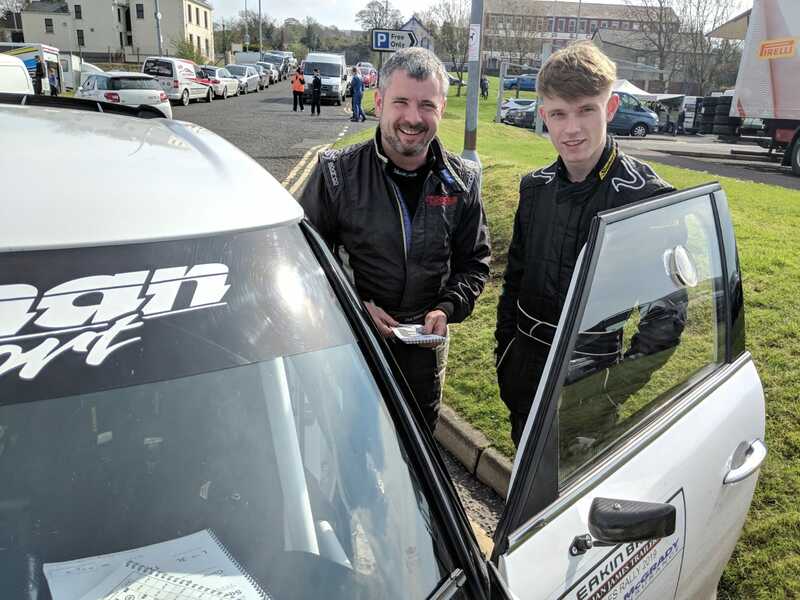 For Derek’s son, Mark (pictured), today is a massive learning experience as he is co-driving on a closed road event with his father for the first time. Martin Cairns lost around 10 seconds when he had to reverse at a chicane and Mark Massey is gradually increasing his pace. He was 13 seconds faster compared to his first run through the stage. Alan Smyth’s Evo X was sporting some ‘bale rash’ and Camillus Bradley is rueing his slow start to the event. Kevin Eves clipped a bank in his Corolla Twin Cam and has a small amount of panel damage but still set a stunning stage time. Paul Britton is struggling on without a working differential in his Subaru while Ryan Loughran lost a bit of time after catching the car in front towards the end of the stage. 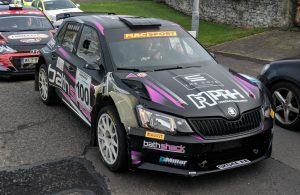 Amy Cox softened her Skoda’s suspension in service and is starting to enjoy it a bit more while Nigel Feeney is “getting better” on what is his second closed-road rally in nine years. 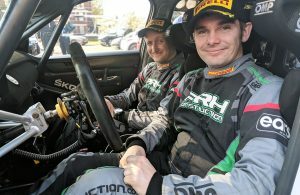 John Devlin had an overshoot on stage one but reported a clean run through stage three while both Fintan McGrady and James Kennedy are revelling in the dry conditions with their Escorts. Latest retirements include Frank Wray who returned to service with no powersteering, closely followed by Darren McKelvey who returned to the service area with a broken gearbox. Crews are now heading to stage four. Live stage end reports are available from fb.com/onthepacenote and results are online at www.rallyscore.net. Next Story → SS4: Allen Out, Henry Leads, McGarrity Up To Third, Feeney Lucky!